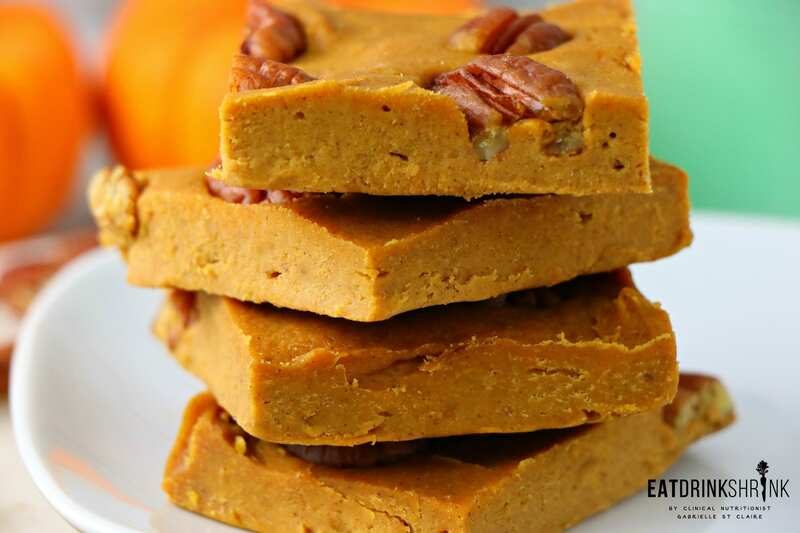 Vegan 5 Ingredient Pumpkin Fudge - Eat. Drink. Shrink. I don’t know about you, but I remember homemade fudge being a big thing when I was growing up. Perhaps it was a souther tradition, but it evolved to just be a staple. To this day I have never made homemade fudge, but the idea of creating a less rich and more nutrient dense variety seemed intriguing. 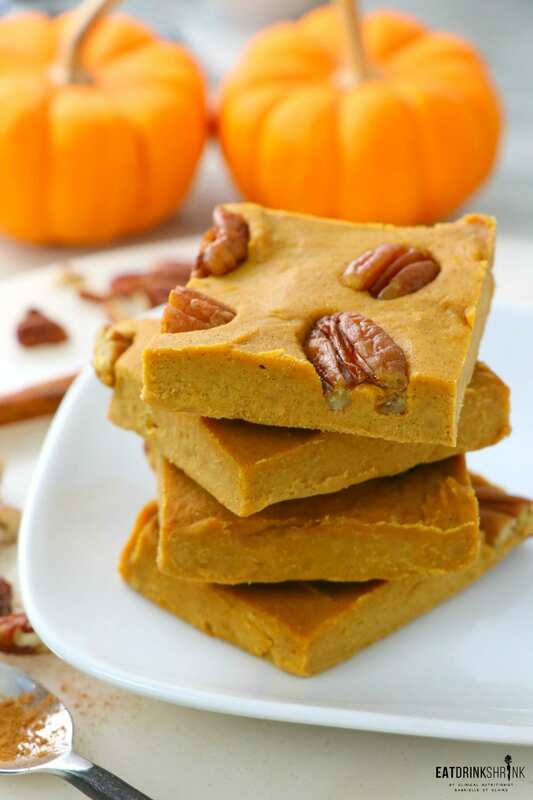 With fall still in full swing, the flavor of pumpkin came to mind! Your typical fudge is packed with corn syrup and evaporated milk. This recipe is coconut butter based rather than coconut oil. As a recipe developer I have my kitchen packed to the max with ingredients, but I honestly rarely ever use coconut butter with my recipes. I find it’s typically cheaper than coconut oil, provides more texture, and a little bit goes a long way. What’s fab about this recipe, is everything! 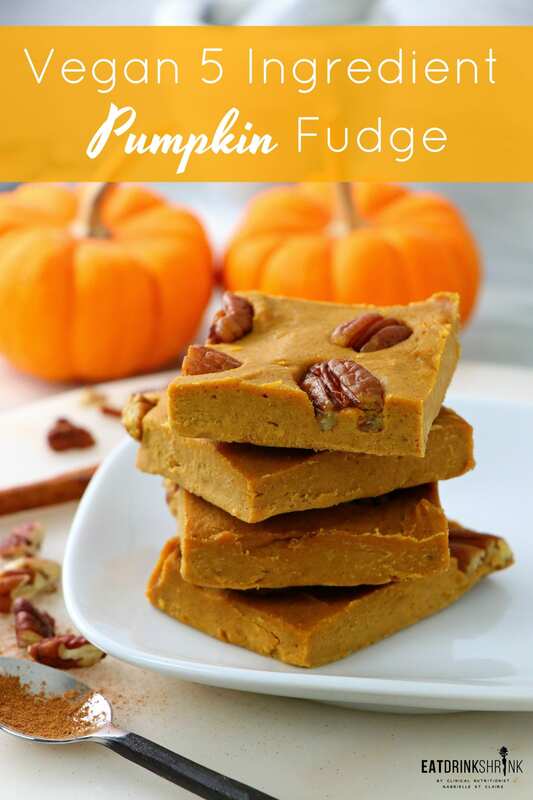 It’s quick, easy, affordable, has minimal ingredients, has good texture, packs a rich pumpkin flavor, will hold up being thawed and frozen over and over, can easily be made in bulk, perf for fall, and perf for fall entertaining! 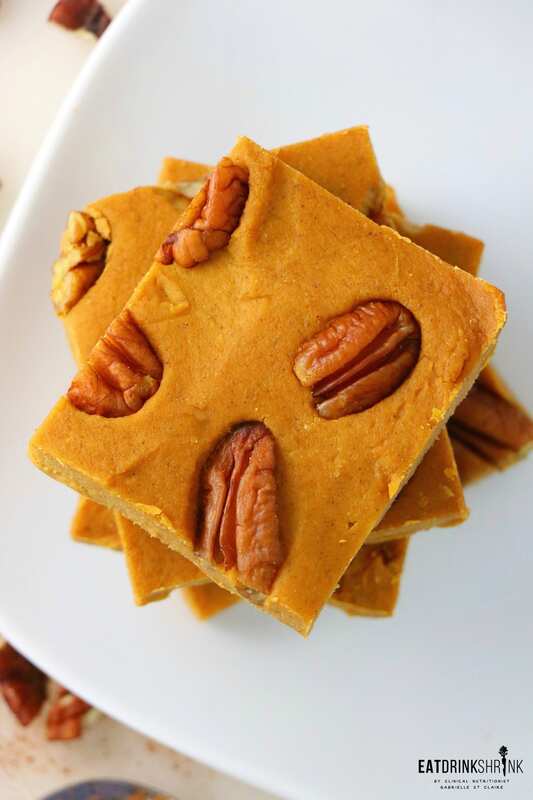 If you love all things pumpkin or just simple modern vegan desserts, you’ll love this recipe for vegan Pumpkin Fudge!! throw everything in a medium size sauce pan and melt until fully combined. Layer into a 8" baking dish lined with parchment paper and top with toasted pecans. Cover, and set in the fridge for 30 minutes to an hour to firm up. Slice and enjoy! Place all ingredients into a vita-mix. For the coconut butter, soft it first before measuring out 1/2 cup. 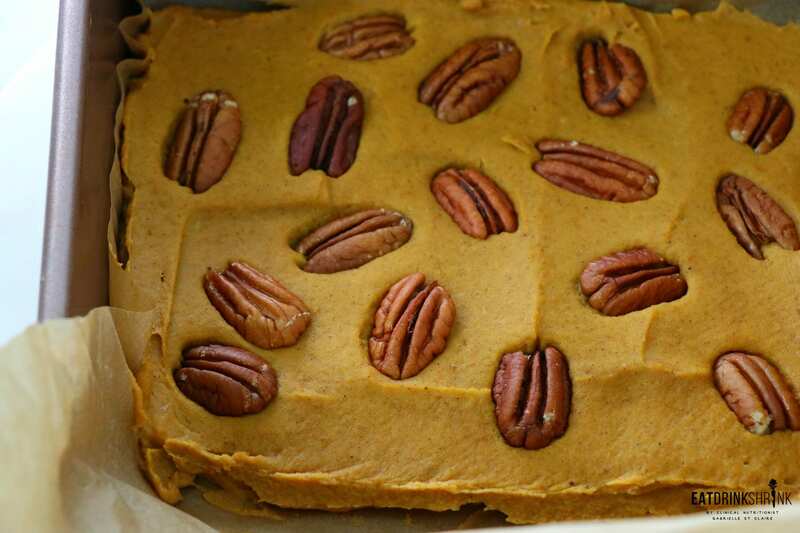 Line a small baking pan with foil or parchment paper – I used a 9×5” loaf pan for a thick fudge. You can use an 8” square pan if you want thinner pieces. Melt coconut oil in a saucepan over medium-low heat or in the microwave for about 30 seconds to a minute. 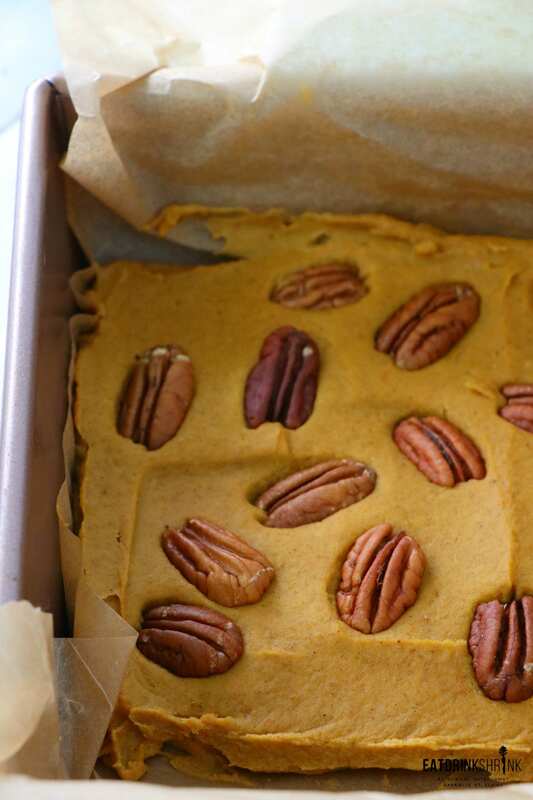 Whisk in the nut butter, pumpkin puree, maple syrup, pumpkin spice, and if using, vanilla extract and salt, into the melted coconut oil until completely smooth. Pour mixture into the prepared pan. Refrigerate until chilled and firm, about 2 hours. Using a sharp knife, cut into squares. Store in the refrigerator.